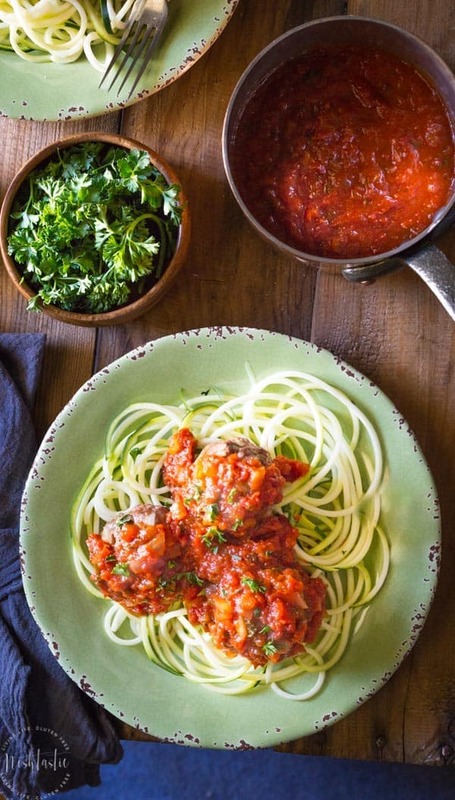 Best Ever Paleo Italian Meatballs in Marinara Sauce! 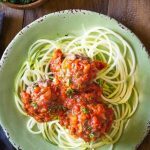 My Paleo Italian Meatballs contain no breadcrumbs or grains of any kind, they are perfect for Whole30 and low carb and keto diets with less than 2g net carbs per serving. These beef and pork meatballs are baked in the oven and the Marinara sauce is made on the stove, from scratch, with tomatoes, onions, garlic and herbs, it’s a delicious and easy recipe and your family will love it! It’s so quick, they only take about 20 minutes to bake and they get a nice sear on the outside from the hot oven that you don’t really get if you cook them right in the sauce. Step 1 – The first thing I do is to use parchment paper to line the sheet pan, it makes for less scrubbing and cleaning later on, I’ve found that meat sometimes sticks to foil. Step 2 – Preheat your oven so it’s ready to bake the paleo meatballs, then mix the ground pork and ground beef together in a bowl along with the egg and seasonings. Step 3 – Now you need to make the meatballs, I used about two tablespoons of the mixture and try to make them all a uniform size so they cook evenly. Step 4 – Bake the meatballs for about 20 minutes, it doesn’t take long! Step 5 –Saute the onions in a pan on the stove, then add the chopped garlic, canned tomatoes, bay leaf and pepper to the pan and simmer for about 20-30 minutes. 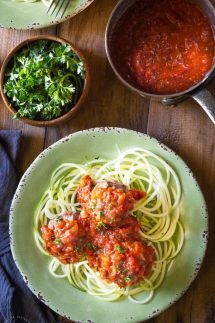 Step 6 –Serve your Paleo Italian Meaballs with the Marinara Sauce over the top and garnish with a little chopped parsley. Half Sheet Pan – I have several sheet pans in my house, but I really love these half sheet pans from Nordic Ware and they are way less dinged up than my other ones! Paderno Spiralizer – This is the spiralizer I have and I love it! I’ve had it for several years without any issues. 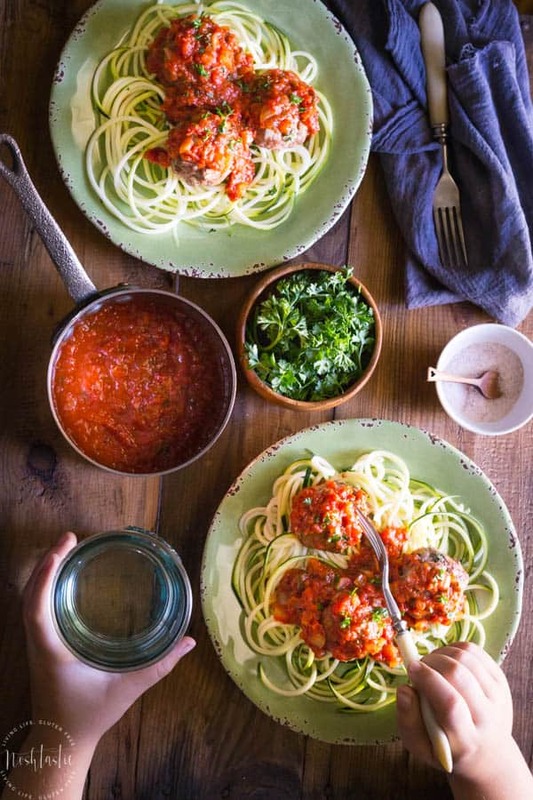 Inspiralized Spiralizer – If I didn’t already own my Paderno, the Inspiralizer would be the one I’d go with. Lots of of my fellow food bloggers have it and have said it holds up really well compared to some of the others. Have you watched my easy recipe video? It's right below the recipe directions. Line a half sheet pan with parchment paper so that the meatballs don't stick to the pan. Mix the meat, egg and seasonings together in a large bowl. Form about two tablespoons of the meat mixture into even sized meatballs and place them on the lined sheet pan. Bake in a 400F oven for 20 minutes, or until fully cooked through. To make the marinara sauce, first add the olive oil to a pan and heat up on a medium heat. Now add the chopped onion and saute for five minutes. Next, add the chopped garlic, canned tomatoes, bay leaf and pepper to the pan. Cook on a low to medium heat for 20 - 30 minutes, until the sauce has thickened. put in sauce and finish cooking there. This recipe sounds absolutely amazing. I’m gonna make it regardless. I am rating it a 5 even before making, because it sounds AWESOME!!!!! Hey Janet! You could cook them in the sauce, but if you make the amount in the recipe you’ll need a pretty big pot! I like to make the sauce while the meatballs are cooking in the oven. I try to avoid pork, would turkey work as a sub-in or would you make them 100% turkey if that were the case? Hi Elizabeth, Thanks for your question. I’m confident that 100% turkey would be just fine! You could do half beef and half turkey, whatever you prefer really. Amazing! We’ve made this into a meatloaf. It freezes so well, and very delicious. Huge hit! 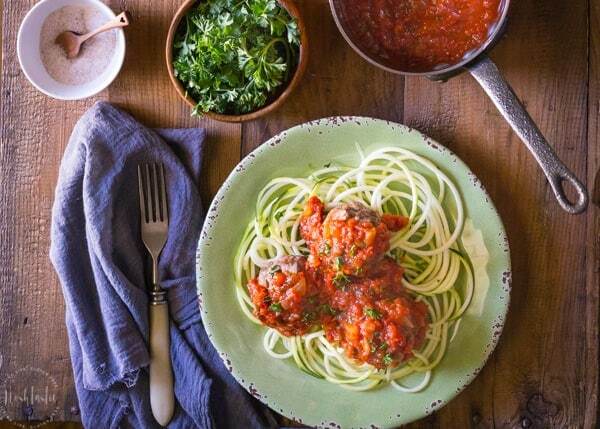 I just made these using all ground beef and dried parsley (didn’t want to go to the store) the sauce was very thick (I used Cento brand with no added ingredients 😉 ) and I put the meatballs in the sauce for extra flavor. It looks great and tastes awesome! Tyvm! Delicious! We sprinkled nutritional yeast on top in lieu of parmesean cheese and it really rounded out this fantastic recipe. Next time I think we will add more veggies to the sauce but my wife and I agree. The recipe for the meatballs is better than our previous recipe with gluten and dairy! Thanks for sharing . Hi Jim, That’s a genius idea to use nutritional yeast instead of parmesan, so glad you enjoyed it! looks like an excellent recipe except i don’t eat pork. i’m finding a lot of these paleo recipes call for pork. it’s very frustrating. has anyone tried cooking this without it? Made these last night for dinner and it was a HUGE success!! I was all out of parsley, so I used Cilantro instead. Other than that, I followed the recipe exactly. We all loved it! This was my first time making my own marinara sauce and the amount of olive oil worried me at first, but it turned out perfect. Thank you so much for this recipe. The look delicious … How many does this make? and How many in a serving? It depends how big you make the meatballs and how hungry your peeps are! There’s 3 lbs of meat total so for the calorie count I divided it by 12 servings, giving you 4oz meat per serving, you should have about 24 meatballs total more if you make them smaller. If you have big eaters in your house who could eat up to 1/2 lb of meat each then it would be more like 6-8 servings. Thank you for the recipe. My husband and I both loved them and he doesn’t like pork and is the pickiest eater ever! I can’t seem to find the nutritional facts…. Do you have them calculated somewhere I missed ? Thank you!!!! These meatballs are so good!! I had them for dinner and I am seriously thinking of having them for breakfast!! These were so good! Thank you for sharing this recipe! I do have a question. I have never made meatballs before and my oven was 400. I put them in the oven for 28-30 minutes because there was still pink when I cut them into. Is that normal for pork? Or should I have cooked them even longer? Thanks! Hi Hannah, I’m thrilled that you loved them! So a couple of things could be going on because they *should* be fully cooked in a 400F oven for almost 30 minutes, unless you made massive meatballs! So first off, it’s possible they were cooked but looked a little pink in the middle anyway? Pork is not as dark as ground beef so that may be what’s going on. The only way to know for sure is to use a meat thermometer and have the tip in the middle of the meatballs to see if it’s up at 160 °F which is the safe temperature for cooked ground pork (145 °F is for whole cuts of pork). It’s also possible if the meat isn’t cooked then your oven is not as hot as you think it is, so I would check it with an oven thermometer, you can get one for less than $10 (I think) in Walmart. I have made these for my family and these are the only ones they want. They are DELICIOUS!!! Thank you! I am doing an elimination diet and Im not able to have tomatoes. Im wondering if there is any possible substitute for the tomatoes. This is one of my go-to meals!!! It isn’t expensive to make, it’s delicious and it always leaves me with leftovers for lunches!!! Thanks for sharing!!! We love this at our house. Hi Kat, I didn’t see your comment until today, I hope you were able to find the temperature in the recipe directions and that they turned out well for you! It’s 400F incase you missed it. If you halve the recipe for the meatballs, do you need to halve everything else too, or just the meat and maybe the seasonings? I’m thinking it would be hard to halve an egg! Sorry for the delay! I’m on vacation. I don’t know if you went ahead and tried it, but I don’t think adding the whole egg would cause too many issues. If I need to halve an egg for a recipe (usually for baking) I beat it in a measuring jug and then just use half of the liquid amount. On the recipe as a whole, if you want it to turn out the way the recipe is written you would have to halve all the ingredients otherwise the proportions will be off. Hi Sheena 🙂 would you also be able to freeze the sauce? I’m currently pregnant and hoping I could make this as a freezer meal! If so, how would I go about freezing this recipe? Hi Nicole, congratulations on your pregnancy! You can freeze the meatballs cooked or uncooked and freeze them separately from the sauce. I would cook the marinara sauce first then let it cool then freeze it in usable portions. Thanks for the note on freezing! I’m getting ready to make this now, but there was no way I could finish it all by myself! Fantastic recipe! I am a big fan of cooking meatballs in my cast iron skillet, but it always takes forever since my pan is never large enough to cook all the meatballs at the same time, so happy to now know the oven works amazing too! I also only used 1 pound of beef and 1 pound of pork (read the recipe wrong!) And the recipe came out great! Still used a whole egg too! Thanks for sharing! This is now a weekly meal in our house love it !!! Excellent! I didn’t need to feed a crowd so only used 1 lb of ground beef. I also prefer more garlic so added an extra clove. This is random but my husband can’t have eggs or gluten. Do you know of a substitute for the egg? Hi Nasreen, I think for this recipe you could just omit the egg and they’ll likely hold together just fine. These are my go to meatballs. Love them! Made this tonight and it was ABSOLUTELY DELICIOUS! Definitely added to my go-to recipes! So so so good! Hi there, so you dont put condiments in the sauce? or are the cans of tomato salted? You can add salt and pepper to taste in the sauce but most canned tomatoes are salted so you may not need it. I have added salt to the meatballs. This recipe is a hit in my household. My daughter takes them to college, she loves them so much. I have doubled the recipe also and frozen them in batches. Great to have on hand in a pinch! The meatballs were awesome, BUT…when you make them BEWARE! I used parchment paper, but fat from the sausage dripped all over my oven and we were overcome with smoke 🙁 If you make these, be sure and line the shelf below your pan with foil. Anyone else run into this issue? Did you use a parchment lined sheet pan or something similar that has sides on it? That should prevent any fat or liquid from dripping or running anywhere else in your oven, I’ve never had an issue with it when cooked on a sheet pan.